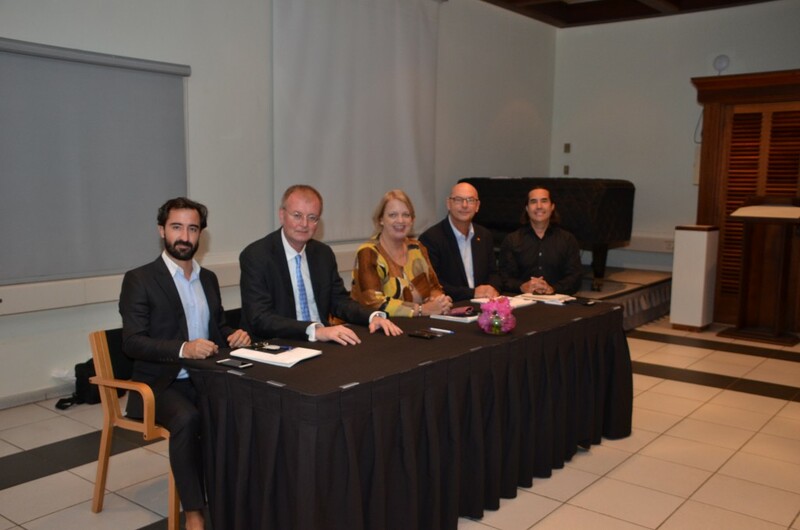 WILLEMSTAD - A new Board of the Consular Corps of Curaçao was appointed at the recent annual general meeting. Karel Frielink, honorary consul of Germany, was re-elected as Dean. The other board members elected were Margaret Hawthorne (U.S. Consul General) as Vice-Dean, Jan Van Belleghem (honorary consul of Belgium) as Treasurer, Ralph Obersi (honorary consul of Mexico) as Secretary and Paul Pradin (honorary consul of France) as Member. The Consular Corps of Curaçao represents 31 countries. Its members serve as consul general, vice-consul, or honorary consul. They assist citizens from the countries they represent visiting or living in Curaçao in some legal and consular matters. They also work to promote good relations between Curaçao and the country they represent. From left to right: Paul Pradin (Member), Karel Frielink (Dean), Margaret Hawthorne (Vice-Dean), Jan Van Belleghem (Treasurer) and Ralph Obersi (Secretary).